Merkel in Davos: Do We Dare More Europe? Is the Fiscal Compact the Big Bazooka? Europe must be a political union, where the European Commission looks more like a government, the European Parliament is stronger and the Council (where member states' leaders are presented) is a kind of its second chamber, and the EU Court of Justice is the supreme court with powers to supervise the implementation of public budgets in individual countries. Such a vision for the future of the European Union was revealed by German Chancellor Angela Merkel at the annual meeting of World Economic Forum in Davos. 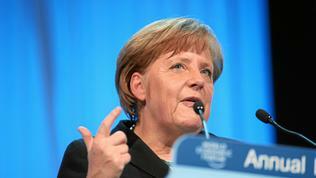 Mrs Merkel delivered the opening speech of the forum and gave interviews for six major European newspapers. In fact, the German chancellor was sufficiently candid and clear to make criticisms of her lacking a political vision sound completely unfounded. However, it is a different question whether this vision is shared by her colleagues in the EU and whether everyone agrees with the path to the goal. In her speech, Ms Merkel was completely honest and did not hide the fact that there were many contradictions on important issues in Europe but she presented her position with the confidence and composure of a person realising the other’s expectations, but not willing to slave for those expectations. How do we measure solidarity? "I sometimes have the impression that internationally people seem to use as a yardstick the degree to which we are willing to be liable for each other and to what extent we are willing to set up a firewall, the extent to which we are willing to actually spend money." This way Angela Merkel synthesised the criticism of Germany's position against sharing responsibilities among the eurozone countries (for instance, through the creation of eurobonds) and increasing the permanent bailout fund, the so called European Stability Mechanism. A similar call has been made by IMF Director Christine Lagarde only a day earlier. According to Angela Merkel, however, increasing the capital of the rescue fund is not the way Europe to regain market confidence. It's not about that Germany does not want to show solidarity or take binding commitments - "what we do not want is a situation where we are forced to promise something that in the end we will not be able to fulfil," she said. In an interview with British newspaper The Guardian, Ms Merkel was even clearer: "There would be no point in promising more and more money without tackling the causes of the crisis.[...] Amid all the billions in financial assistance and rescue packages, we Germans also need to watch that we don't run out of steam. After all, our capacities aren't infinite, and overstretching ourselves wouldn't help us or the EU as a whole." As to the solidarity, according to her it is not measured by how much money we are willing to give, but by how far we are willing to go in the European integration. Ms Merkel said and answered: "Yes, we do." What does this mean? "We have to be ready to transfer more competences to Europe." What competencies? On first place - the budgets. "The real message of the fiscal compact that we are trying to agree upon right now is that each and everyone is to introduce a cap on debts, the so called debt brake and inscribe this in the constitution and the ECJ will monitor whether this is actually done. So we are no longer using any excuses or we are no longer deluding ourselves or deluding others." But it is not just about fiscal discipline, it is about sustainability of budgets, sustainability of growth, not only in Europe but worldwide, Ms Merkel noted: "Sustainability must be the trademark of the future policies." Therefore, austerity is not enough - what is vital is to make structural reforms that will create jobs. 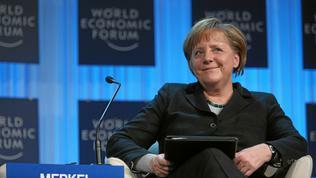 Competitiveness and jobs creation were the two key tasks of Europe as highlighted by Ms Merkel. They will be the main topic of the upcoming European Council on Monday (30 January), and France and Germany have already submitted a detailed proposal for future action. The focus in their proposal, highlighted by Ms Merkel in Davos too, is convergence of policies as much as possible. Moreover, while maintaining the integrity of the European Union of 27 countries, she noted. But when it comes to convergence of policies it should not be done "without ambition", according to the principle of lowest common denominator, Ms Merkel warned – we should seek best practises and models, because on this will depend the role played by Europe at the global level. Because, if Europe does not develop and is not innovative for many years to come, it will remain just a place where people can only spend their vacations, Ms Merkel said. 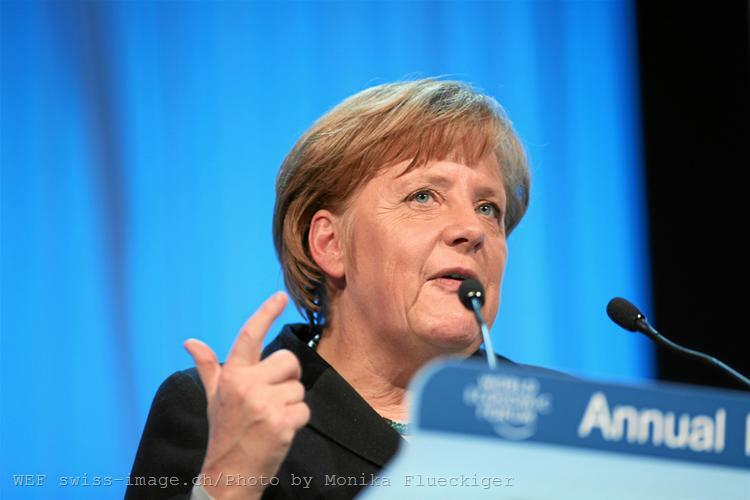 Angela Merkel did not miss the opportunity to also respond to another criticism, often referred to Germany – that the country has contributed to the deepening of macroeconomic imbalances in the euro area, generating large trade surplus at the expense of deficits in the weaker countries. And more importantly - that it has refused to take steps to reduce it, as many insist. Discussions on the issue were especially heated last year when the European Parliament adopted the EU economic governance package and in particular the new procedure for monitoring and correction of macroeconomic imbalances. Ultimately, the lawmakers decided to monitor as countries with deficits, so those with large current account surpluses, which to be forced under the new procedure to take measures to stimulate their domestic demand. Of course, the reason for this insistence was mostly Germany. Ms Merkel commented on the issue saying: "Germany is going to participate in reducing such imbalances in those areas where we see unfair barriers existing, for example in the services area." But when it comes to different levels of competitiveness, we must ask whose model we want to follow, what are the best practises, she added. It is not the first time for Berlin to make it clear that it will not reduce its competitiveness because of unwillingness or inability of others to increase theirs. With regard to global priorities, the German chancellor highlighted as the most important tasks ensuring free trade, amid increasing signs of protectionism; completing financial sector regulation; and the "favourite" Franco-German theme – imposing a financial transaction tax. 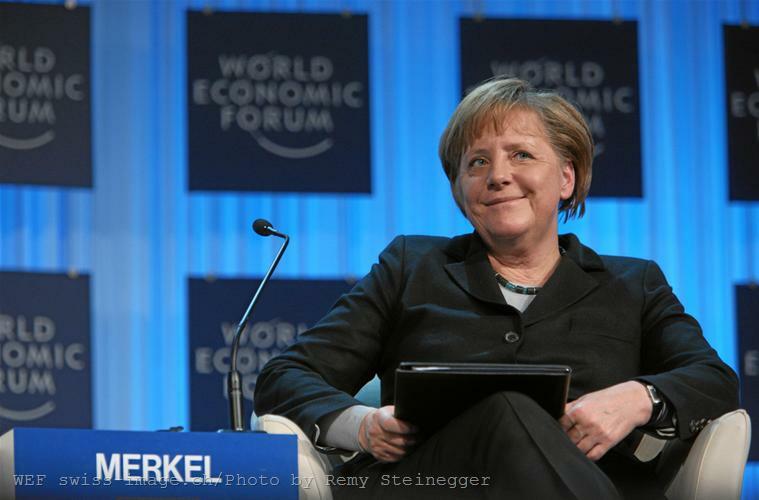 Klaus Schwab, World Economic Forum chairman, asked Ms Merkel a curious question about her relations with French President Nicolas Sarkozy. I know that many people are frustrated by the fact that we agree on many issues in advance, before the summits, the German chancellor replied bluntly, but people don't like us when we don’t like each other and at the same time, they don’t like us when we like each other, she explained. According to her, it is not about the personalities of Angela Merkel and Nicolas Sarkozy, but about the existence of historical contradictions on certain issues between the two countries, which should be adjusted. Asked how she imagined Europe 20 in years, Angela Merkel described the vision with which I began this text, adding: "And I hope that almost all countries will then be members of the euro, not all but ... I don’t want to create diplomatic problems here." The answer provoked loud laughter in the hall, because the prime minister of Denmark, Helle Thorning-Schmidt, was among the audience, and the reply would undoubtedly have provoked a strong reaction from British Prime Minister David Cameron too (UK and Denmark are the only EU countries having ‘opt-out’ and ‘opt-in’ in terms of the euro). In the framework of the forum, Ms Thorning-Schmidt participated in a discussion named "Rebuilding Europe", together with her colleagues from Finland Jyrki Katainen and Ireland Enda Kenny, as well as Polish President Bronislaw Komorowski. The British Prime Minister David Cameron delivered a frank and even aggressive speech, which euinside presented to you in a separate analysis. Solidarity in Europe is a comprehensive study of the idea of solidarity from the early nineteenth century to the present. It covers social and political theory, Protestant and Catholic social ethics, and the development of the concept of solidarity in eight European nations - Germany, United Kingdom, France, Italy, Spain, Sweden, Norway and Denmark.